Cardiff’s Porter’s Bar and the all-star local team behind its beer pumps has been named winner of PRS for Music’s national Music Makeover Pub competition. The hidden Harlech Court gem beat more than 200 pubs across the UK, trumping pubs from Glasgow to Cornwall for the sought after accolade due to the pubs talented musical staff and their vision to give customers the best possible music experience. 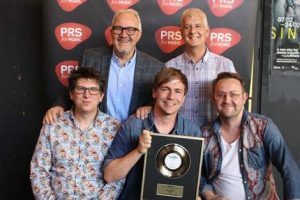 As well as an upgrade to the music set-up, which includes a bespoke music consultancy from globally renowned producer Steve Levine (The Clash, Beach Boys), the prize also included a gold disc presentation, which took place on Thursday 13th July. PRS for Music launched the annual Music Makeover competition seven years ago to raise awareness of the important impact music can have on local businesses and to showcase those businesses that use music to its maximum effect. Porter’s is an established creative hub in Cardiff, with events ranging from theatre productions to comedy nights, while also offering a platform to local and emerging musicians. Many of the staff are artists themselves, creating a welcoming environment for performers and customers alike. Up against stiff competition, Porter’s Bar was ultimately awarded the top prize due to the Manager’s enthusiasm. As part of the celebrations, PRS for Music held a special launch party, followed by live performances from Welsh acts Sweet Baboo (BBC) and Kizzy Crawford (BBC) at Porter’s. Both acts are members of PRS for Music, the collective society that represents the rights of over two million songwriters, composers and music publishers across the globe through its networks. Sweet Baboo has also previously been funded by the PRS Foundation, the UK’s leading funder of new music and talent development across all genres. PRS for Music launched the annual Music Makeover competition seven years ago, starting with the pub sector, before launching in hair and beauty a year later. More recently, as the competition has grown, PRS for Music has opened Music Makeover up to restaurants and fashion retailers. The aim of the competition is to showcase and raise awareness of how important music is to local businesses; from the quality of the sound system, to acoustics, volume and playlists, music has a huge impact on both customers and staff.